Swimming microengines made from platinum and iron are highly efficient in removing organic pollutants from water using hydrogen peroxide. Researchers from the Max Planck Institute for Intelligent Systems in Stuttgart have developed a new method for the active degradation of organic pollutants in solution by using swimming microengines. The mobile microcleaners consist of an outer iron and an inner platinum layer, thereby combining two functionalities. Hydrogen peroxide, which must be added to the contaminated solution, acts as fuel for the platinum micromotors and as reagent for degrading organic pollutants on the iron layer. Not many methods for the successful cleaning of polluted wastewaters exist. The Fenton reaction, one of the most popular advanced oxidation processes for the degradation of organic pollutants, relies on spontaneous acidic corrosion of the iron micromotor surface in the presence of hydrogen peroxide. The scientists report that the oxidation of organic pollutants achieved by a swarm of these self-propelled microjets is twelve times higher than when using immobile iron microtubes. Common water treatment methods are inefficient in removing most types of organic pollutants. Mineral oils, pesticides, organic solvents, paints and organochlorides cannot be removed using choride, ozone or flocculation methods that are part of regular water processing procedures. The Fenton reaction, on the other hand, is highly efficient in removing these pollutants. The term ‘Fenton reaction’ refers to the use of a combination of iron and hydrogen peroxide to oxidize organic pollutants, thereby degrading them to carbon dioxide and water. The multi-stage reaction is catalysed by Fe(II) ions. 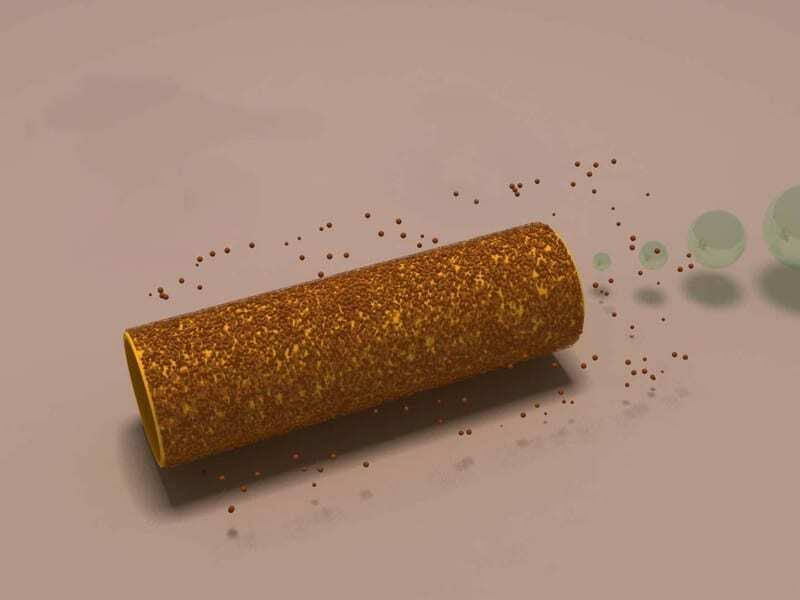 The group of Samuel Sánchez at the Max Planck Institute for Intelligent Systems has now combined the best of two worlds and created a two-layered, self-propelled version of this microscopic cleaning system. Their microjets have an inner platinum micromotor fuelled by hydrogen peroxide and an outer cleaning layer where hydrogen peroxide reacts with organic pollutants in the presence of iron. The Fe(II) ions that are needed as catalysts for the Fenton reaction are formed when the iron on the outer tube surface establishes contact with water. To produce their mobile cleaning systems, the researchers used a method for rolling up metal thin films that was developed only a few years back. They evaporated a 100-200 nanometre thin layer of iron onto a glass surface coated with a dense pattern of aligned lacquer squares. In a second step, the researchers added a platinum layer of only one nanometre thickness, using a special sputtering technique. Due the different mechanical properties of the metals, the double layer starts to roll up into a tube-shape once the lacquer layer is removed. “This technique allows us to produce large numbers of multifunctional tubes”, says Samuel Sánchez, the head of the Max Planck Research Group in Stuttgart. The platinum layer functions as an engine, because, much like iron, it catalyses a chemical reaction with the oxidizing agent hydrogen peroxide. “Hydrogen peroxide acts as fuel for our miniature submarines,” explains Luis Soler, a scientist in the research group. When hydrogen peroxide and platinum react, platinum acts as a catalyst for the decomposition of hydrogen peroxide into water and oxygen, thereby forming small bubbles. As more and more bubbles are produced, they escape from the tube. Initially, differing amounts of oxygen exit on either side of the tube and the tube is randomly jet-propelled. As soon as the tube has reached a certain speed, though, all bubbles escape to one side, and the tube is thrust into the opposite direction of the escaping bubbles, thereby feeding more fuel into the front end. The initial idea to encase platinum microengines with an iron layer came to life while the scientists were thinking about an entirely different problem. Typical visions of the technological possibilities of future micro- and nanomotors include the rapid transportation of pharmaceutical agents to specific target areas like tumour cells, for example. Upon arrival, they would drill through the cell membrane like a nanocanula and inject the active agent directly into the target cell. However, one large obstacle remains in the way of achieving this vision: hydrogen peroxide, like all other fuels that have been developed for these motors, harms living organisms. And this is where the idea for a new application comes in: the scientists decided to employ their micromotors in places where the use of hydrogen peroxide is not a disadvantage, but rather serves an important function as co-reagent. Because the iron layer is also magnetic, the tubes can be steered to pollutants that are difficult to reach and they can be recovered after their job is done. April 10, 2019 - Wealth from waste – three ways pollution can be turned into something useful The Conversation - UKScientists are finding ways to generate something useful from the pollution in our environment. April 16, 2019 - Walmart sets 2025 chemicals target for textiles suppliers Chemical WatchRetail giant Walmart has set a goal to reduce the discharge of priority chemicals from the manufacturing processes of its textile and apparel suppliers by 2025. April 1, 2019 - The Hidden Air Pollution in Our Homes The New YorkerOutdoor air has been regulated for decades, but emissions from daily domestic activities may be more dangerous than anyone imagined, Nicola Twilley writes. March 20, 2019 - Can sodium make organic cross-couplings sustainable? | Research Chemistry WorldMicroparticle dispersions make abundant but feisty sodium safer to use as replacements for organolithium in carbon–carbon bond formation.